NEWPORT NEWS, Va. (June 9, 2017)—Huntington Ingalls Industries (NYSE:HII) announced today that the Virginia-class submarine Indiana (SSN 789) was launched into the James River at the company’s Newport News Shipbuilding division. The boat was moved to the shipyard’s submarine pier for final outfitting, testing and crew certification. 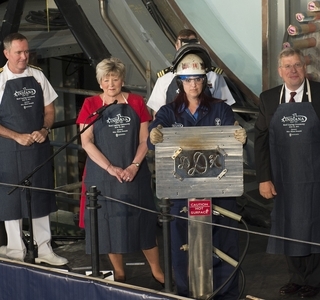 “Launch is a true testament to our shipbuilders’ roughly four years of hard work,” said Matt Needy, Newport News’ vice president of submarines and fleet support. “Over the next several months, we will work closely with the Indiana crew to bring this great ship to life. 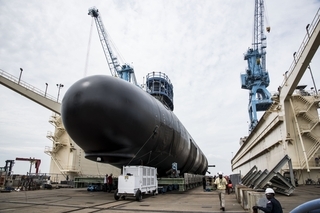 With the Navy’s recent increase in SSN force structure requirements from 48 to 66 submarines, the shipbuilders here at Newport News and at our teaming partner, Electric Boat, understand the importance of getting these highly valued ships delivered and ready for mission-tasking by our Navy leadership. Indiana is the 16th Virginia-class submarine and the eighth that will be delivered to the U.S. Navy by Newport News. Nearly 4,000 shipbuilders have participated in Indiana’s construction since the work began in September 2012. Indiana was moved out of a construction facility into a floating dry dock using a transfer car system. The floating dry dock was submerged, and the submarine was launched into the James River. 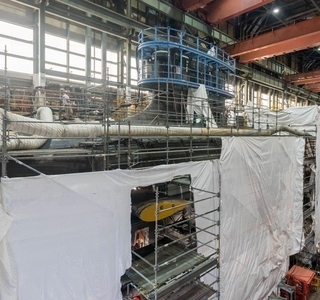 The approximately 7,800-ton submarine was moved to the shipyard’s submarine pier, where final outfitting, testing and crew certification will take place. 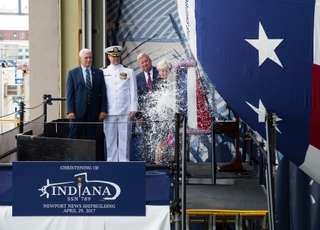 “Our Indiana sailors are honored to be at the helm as the newest Hoosier boat launches into a new chapter at sea,” said Cmdr. Jesse Zimbauer, Indiana’s commanding officer. Virginia-class submarines, a class of nuclear-powered fast attack submarines, are built for a broad spectrum of open-ocean and littoral missions to replace the Navy’s Los Angeles-class submarines as they are retired. Virginia-class submarines incorporate dozens of new technologies and innovations that increase firepower, maneuverability and stealth and significantly enhance their warfighting capabilities. These submarines are capable of supporting multiple mission areas and can operate at submerged speeds of more than 25 knots for months at a time.